Richard Sykes' Citroen C2 R2 Max... outside a pub? Stourbridge rally driver Richard Sykes will kick off his 2012 season this weekend when he contests the Rallye Sunseeker Challenge event, the opening round of the BRC Challenge championship. Sykes will make a full return to rallying this year after a quiet 2011 which saw him compete on two BRC Challenge events, both of which he led, as well as the end of year Kall Kwik rally. "Rallying took a back seat last year due to me getting married and having a six-week honeymoon at the rugby world cup in New Zealand," said Sykes. "The two BRC Challenge events I did were very enjoyable though and the competition was very close." "I’m really looking forward to be doing the full BRC Challenge again this season and I will be going as hard as I can to try and win the title, it must be our year this year." 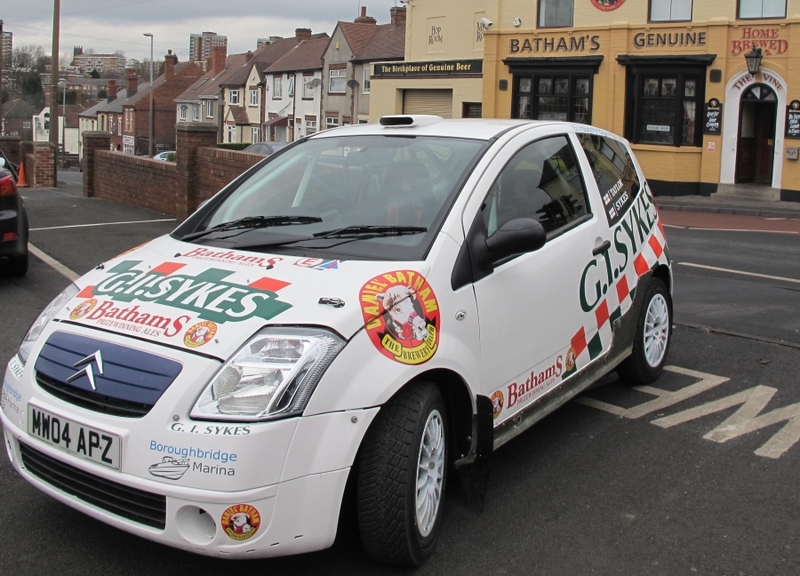 Sykes will use his usual Citroën C2 R2 Max with support from Bathams Brewery, G I Sykes Ltd, Boroughbridge Marina and Silverstone Tyres. Simon Taylor will be in the co-driver’s seat on what will be the 7th anniversary of the pairings first event together – they contested the 2005 Rallye Sunseeker in a Peugeot 206. Rallye sunseeker starts this evening in Poole, with the first stage early on Saturday morning. Rallye Sunseeker, Manufacturer's round up. BTCC sorts out Turbo differential effect.